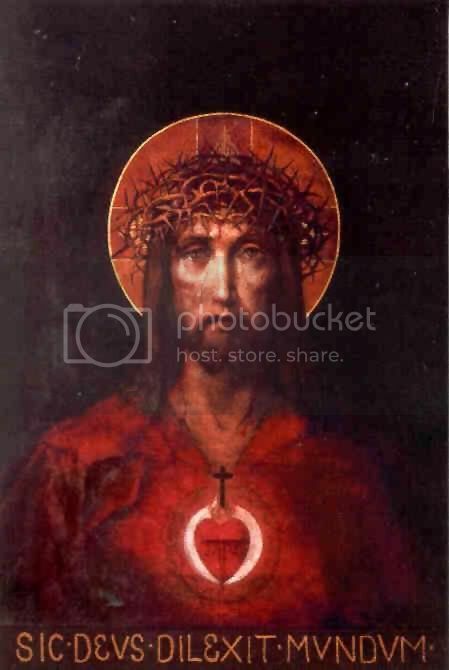 Devotion to the Sacred Heart of Jesus is a most fitting way to respond to Pope Benedict XVI�s invitation to center our Lenten observance upon the text from the Gospel according to St. John: "They shall look on Him Whom they have pierced" (John 19:37). Our Holy Father, by inviting us to look upon the pierced side of our Lord Jesus, invites us to contemplate the glorious pierced Heart of Jesus, the pre-eminent sign of God's immeasurable and ever faithful love of us. From the Heart of Jesus flow all graces in the Church. Looking upon Him Whom we have pierced by our sins, we come to understand ever more fully the great mystery of His response of love to our indifference and even our hostility in sinning. In a particular way, we are drawn to the Heart of Jesus, which is open for us in the Sacrament of Penance to receive the confession of our sins and to pour out upon us the healing grace of forgiveness. Devotion to the Sacred Heart of Jesus draws us, above all, to communion with our Lord Jesus in the Eucharistic Sacrifice. From the glorious pierced Heart of Jesus flows the Body, Blood, Soul and Divinity of Christ for our spiritual nourishment during the days of our earthly pilgrimage home to God the Father. The Enthronement of the Sacred Heart of Jesus in our homes and the consecration of ourselves and our homes to the Sacred Heart of Jesus are at the heart of loving contemplation of Him Whom we have pierced. The Enthronement and Consecration represent our way of living each day, in the company of our Lord, resting in His Heart and drawing from His Heart the gift of selfless and pure love of our neighbor. "In that way, no matter how harsh the conditions in the camps might be, how cruel and useless the work might seem, it took on new meaning and added value. It was something of which a man could be proud each day, because it was his to offer back to God. Each day of labor and hardship, like the grains of wheat ground up to make the host at Mass, could be consecrated to God and be transformed into something of great value in God�s sight; it was a sacrifice each man could offer back to God through the long, hard days. The grinding routine of daily labor, even here in Siberia, could have a meaning, did have a value, even as the lives of all men everywhere � no matter how dull or routine or insignificant they might seem to the eyes of men � have a value and a meaning in God�s providence" (Father Walter J. Ciszek, SJ, He Leadeth Me, San Francisco: Ignatius Press, 1995, pp. 141-142). Our hearts placed in the Sacred Heart of Jesus, through the Morning Offering, become truly great with love of God and our neighbor. No matter what our condition, our hearts can bring the divine love, found in the Heart of Jesus, to others, especially those in most need. During Lent, we become especially conscious of the significance of every Friday of the week, since the Good Friday of our Lord's Passion and Death. Every Friday is for us a special time to reflect upon Christ's Suffering and Dying, and to unite ourselves to the outpouring of His life, especially through participation in the Holy Eucharist. That is why we are asked to abstain from eating meet on Friday, a small act of penance which keeps the Suffering and Dying of Christ before our eyes. In the devotion to the Sacred Heart of Jesus, participation in the Holy Mass on the First Friday of each month, with reception of Holy Communion, is the way of offering reparation to our Lord for our coldness and indifference before the gift of His love. Essentially connected to the reception of Holy Communion on the First Friday of the month is the practice of a holy hour on the Thursday before the First Friday. The holy hour is spent meditating on the Passion and Death of our Lord. Through the holy hour, we strive to watch and pray with Christ in the Garden of Gethsemane. "I promise you in the excessive mercy of my Heart that my all powerful love will grant to all those who receive Holy Communion on the First Fridays in nine consecutive months the grace of final perseverance; they shall not die in any disgrace, nor without receiving their sacraments. My Divine Heart shall be their safe refuge in this last moment" (Timothy T. O�Donnell, Heart of the Redeemer, San Francisco: Ignatius Press, 1992, p. 140). "This promise was made to the person who completely surrenders himself in a deep and unconditional act of faith. It is a beautiful expression of the Lord�s desire to share Himself with us in His sacrament of love. This is essentially the same promise which our Lord made in the Gospel to those who would each His flesh and drink His blood" (John 6:65) (Timothy T. O'Donnell, Heart of the Redeemer, San Francisco: Ignatius Press, 1992, p. 260). Those who observe the First Friday are not trying to buy God's love but are responding to His love with the most perfect expression of love possible for us on this earth. They do not stop the devotion after nine months but continue the devotion as a way of keeping alive in their hearts the mystery of Christ's Suffering and Dying. Beginning or renewing the practice of the First Friday Communion of Reparation and of the Thursday Holy Hour in preparation for it is an excellent way to make our Lenten observance rich in grace for us throughout the year. The First Friday and the Thursday which precede it become privileged times for our looking upon Him Whom we have pierced and lifting up our hearts to His glorious pierced Heart with ever greater love and devotion.